Photo of Motoo Kimura (left) and James Crow (right) is courtesy of PPGBM Museum of Genetics, Federal University of Rio Grande do Sul, Brazil. For two weeks in the summer of 1953, Motoo Kimura enjoyed a welcome respite from loneliness and the austerity of post-war Japan. Crossing the Pacific from Yokohama to Seattle to commence PhD studies at Iowa State University, Kimura played deck golf, enjoyed full service meals, and napped to the soothing vibrations of the venerable passenger liner Hikawa maru. He also sought solace in equations, writing a paper on how populations evolve when the intensity of natural selection fluctuates at random. His chronic stomach troubles, which he attributed to stress, vanished. A month later, Kimura took his fluctuating selection paper with him to a conference in Madison, Wisconsin. * Struggling with English, he managed to get lost in the corridors of the lakefront building where the meeting was held, until he was stopped by a tall American. 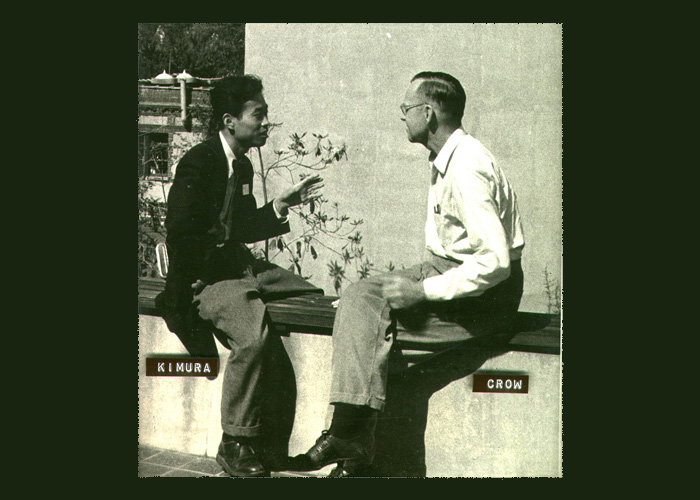 The man, population geneticist Jim Crow, asked Kimura if he needed help finding his way. Crow would later say this chance encounter changed both of their lives. Crow would become Kimura’s mentor, in the truest sense of the word. Crow guided and challenged him. Crow connected Kimura with scientific luminaries. He focused Kimura’s intensity and mathematical talent on important biological problems. Their lifelong intellectual partnership would link their names forever—Crow and Kimura—in an iconic textbook, but also—Kimura and Crow—in a 1964 GENETICS article that paved the way for the study of evolution at the molecular level. As part of the GENETICS Centennial Classic series published throughout 2016, Warren Ewens introduces Kimura and Crow 1964 as one of the journal’s most influential papers. At their first meeting in Madison, Crow had been startled to hear Kimura’s name. Though Kimura was an obscure student, Crow had recently been forwarded some of his papers. Based on the originality and depth of the ideas, he had assumed Kimura was a distinguished professor, not an isolated student who had taught himself both population genetics and mathematics. Kimura was originally trained as a plant cytologist; he had been fascinated by plants since boyhood, and cytogenetics had been the hot field in Japan at the time. But his interest in chromosomes waned as he began yearning to “do something in genetics like what the theoretical physicists were doing in physics.” This ambition was buoyed by Kimura’s regular, hunger-fueled excursions to the house of his cousin-in-law Matsuhei Tamura, a mathematical physicist. Kimura visited almost every Sunday, partly because he was intensely interested in the quantum physicist’s stories, and partly because he needed to fill his belly during the post-war food shortages. 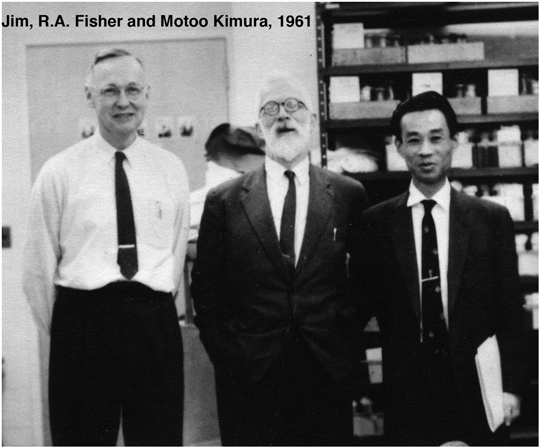 James F. Crow, R. A. Fisher, and Motoo Kimura in the Crow lab in 1961. From Susman and Greenberg Temin 2012. But after this giddy start, slogging through the reality of compulsory graduate courses in Iowa was a letdown. Kimura was bored by the quantitative genetics focus of his advisor Jay Lush and longed to return to the warm and intellectually bracing atmosphere he had enjoyed during his brief visit with Crow. Nine months later, Kimura transferred to Madison to study with Crow. Professor Crow ran his laboratory on the principles of bringing smart people together to pursue their passions and encouraging interaction, mutual respect and support, constructive criticism, and the free sharing of ideas and resources. There were no formal group meetings or reports, as there was so much daily interaction that group meetings would have been superfluous. He would advise, suggest, and encourage, but never direct or cajole. Kimura later judged the brief two years he spent earning his PhD under Crow as the most productive of his life. It was during this time that he developed his model of random drift and introduced an equation for modeling random dynamic processes (the Kolmogorov backward diffusion equation) to find the probability that a gene allele reaches fixation (i.e. is carried by every individual in the population). This equation would later become a standard tool in population genetics. Kimura moved back to Japan after graduation, and a few years later, in 1958, Crow wrote to him about some interesting new data on the nature of bacterial mutations from his friend Joshua Lederberg. Most of the point mutations that arose in Lederburg’s experiments were independent. In other words, nearly every mutation yielded a new allele. This result fit with the emerging molecular view of the gene as a sequence of hundreds or thousands of nucleotides, in which every nucleotide substitution or rearrangement would count as a new allele. Crow wondered how this conception would affect population genetics models. He posed a specific problem to Kimura: If you assume that every mutation generates a new allele and that a population has reached genetic equilibrium (i.e. allele frequencies are stable from generation to generation), what would be the proportion of loci in a population that are homozygous? A little over a year later, Kimura wrote back with the answer. Crow was once more impressed with the practical simplicity of Kimura’s solution, a straightforward equation based on mutation rate and the size of the population (technically speaking, the effective population size). Working together in Madison in 1962 and 1963, this tidy equation became the core of their infinite alleles model (sometimes known as the “infinitely many alleles” model). The 1964 paper began by describing a basic model under the assumption that each mutation has no net effect on the bearer’s survival and reproduction, that is, each mutation is “neutral”. The rest of the paper built on this foundation by introducing the effects of natural selection and random drift, but it was the first, introductory section that was to become most influential. The infinite alleles model was ready and waiting for the arrival of molecular data to population genetics two years later when the field was electrified by Richard Lewontin and Jack Hubby’s analysis of protein variation by gel electrophoresis (another GENETICS paper). Haldane once said that the highest honor a scientist can have is for his theory to be so taken for granted that his name is no longer associated with it. We no longer mention Mendel when we conduct breeding experiments or Sturtevant when we map chromosomes. Likewise, neutral assumptions permeate modern studies of molecular evolution and population genetics. In most cases Kimura is not mentioned. Crow and Kimura remained close friends and collaborators for the rest of their careers, and in 1970 they published a widely used textbook, An Introduction to Population Genetics Theory. 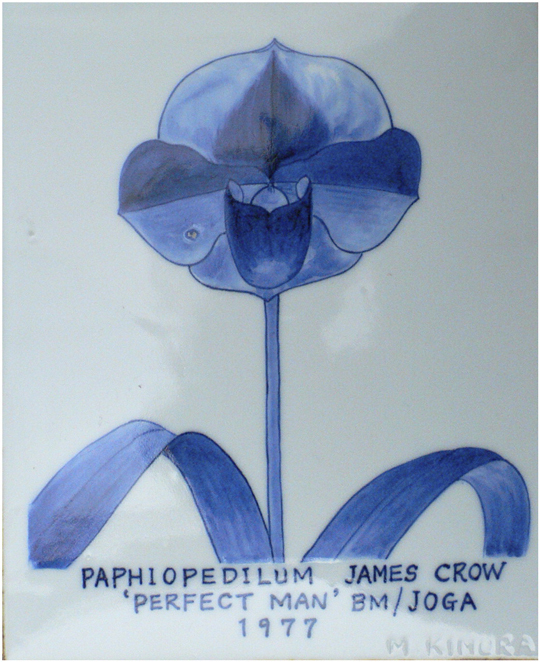 With his share of the book earnings, Kimura built a greenhouse and bred a prize-winning orchid that he named “Paphiopedilum James Crow”. Though not an expert gardener like Kimura, Crow did know a great deal about cultivating students, providing just the right conditions to allow them to flourish and bloom. Warren J. Ewens (2016). Motoo Kimura and James Crow on the Infinitely Many Alleles Model. Motoo Kimura (1954). Process Leading to Quasi-Fixation of Genes in Natural Populations Due to Random Fluctuation of Selection Intensities. *Crow repeatedly described this as the Genetics Society of America meeting. But in 1953 the GSA annual meeting was held in conjunction with AAAS in Boston. The meeting held Sept 6-10 in the Union at Madison that year was the AIBS meeting, for which Crow was in charge of room assignments. Crow might have been confused because in the previous and following years the GSA meeting had been held at the AIBS meeting.